Perfect focus and nice cropping. A very appealing photo! Good still life. Colors are spot on. The grapes look a little dull with the dust on them. 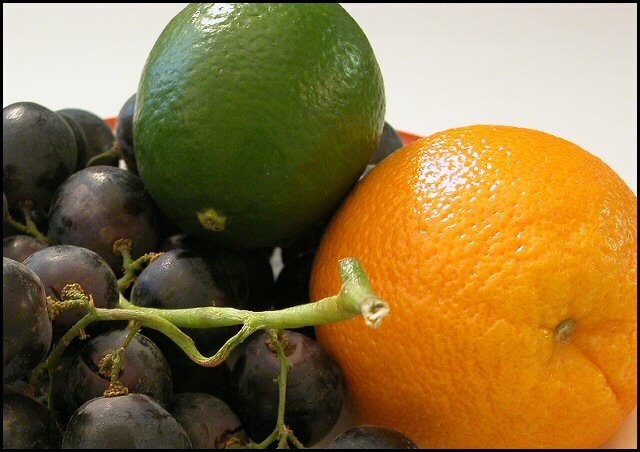 One trick a lot of people use is to spritz the fruit with water for a fresh, vibrant look. The rim of the plate in the background is also a little distracting. The tight crop gives a somewhat crowding feel, but the white background helps give it a little 'breathing' space too. A different angle or with more dramatic lightning and this would really enhance the image. Proudly hosted by Sargasso Networks. Current Server Time: 04/23/2019 08:33:22 AM EDT.